If you want to take your upcoming event to the next level, you need to consider what happens before attendees even get their name tag – the journey to the venue. Whether your attendees are flying from different countries or nearby cities, using ride sharing apps or taxies, the journey could be nerve-wracking. Some attendees might be nervous about arriving alone, navigating a new airport, or just feel bored while traveling solo. Helping them have a better experience might be interesting to you, but seems impossible with your busy schedule. 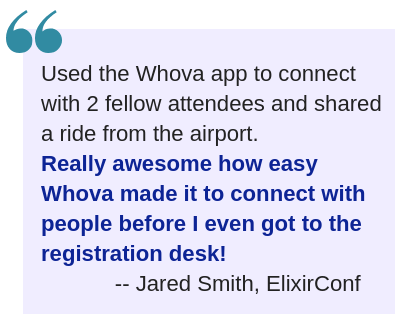 Thanks to Whova’s newest Ride Sharing feature, it’s easy for your attendees to connect before the event and coordinate their arrivals. This tool can be found in the Community Board, which has become one of our most popular features, as it allows attendees and organizers to discuss all aspects of the event, from organizing social gatherings to Q&As. Our Ride Sharing feature takes this a step further. A personal experience. Providing this feature allows attendees to feel they are being taken care of from the beginning. It sets a good impression for your planning team before they hit the registration desk. A chance to network. No one likes walking into an event alone. When attendees can ride together, they can get to know each other and make connections. Who knows – their new mentor or business partner could be in that ride share! A cost-efficient journey. Taking a taxi is convenient for a long-distance or late-night trip in a new city, but it can be pricy. Sharing a ride with fellow attendees will not only enjoyable but also cost-efficient. The best thing is, it’s very easy to set up and takes almost zero effort for you to enable it for your event. Plus, it comes at no additional charge. Just opt-in for the feature, and your event attendees will enjoy an extra bit of service that sets you apart. Let’s talk about Elizabeth who was attending a conference in Los Angeles. She would travel solo, and it seemed taking a taxi or a metro alone was the only option for her. 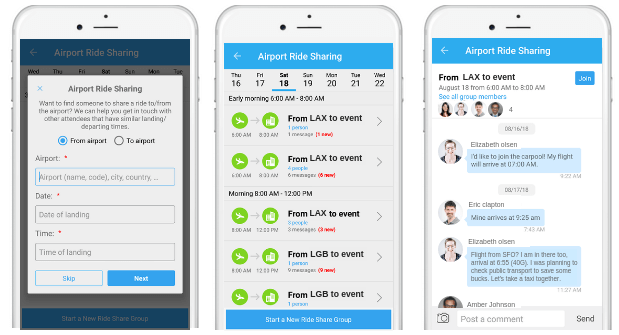 However, this event enabled the Ride Sharing feature, so Elizabeth started a new ride share group within the Whova app with her flight information to find someone to carpool with. There were a few other groups already, but they all had earlier arrivals. The Ride Sharing feature is also available through a webpage. Another attendee, Eric, could submit his preferred time via the web link the organizers sent out. He was alerted that a group had been formed for his arrival time, and he connected with Elizabeth and other people in the same ride share group. They arranged to meet at one terminal to get a taxi together to the event. Upon landing at LAX, Elizabeth, Eric and another attendee were able to spend the entire ride over to the venue discussing the event. They exchanged e-business cards, and decided to meet up at the dinner later that evening. The entire group was grateful to have made these connections before the event began, setting then up for an rewarding experience all weekend long. Lost and Found. No more panicking about a lost notebook or asking busy organizers for help! Your attendees can post messages when they lose or find an item, and can get it back to its owner. Social Activities. 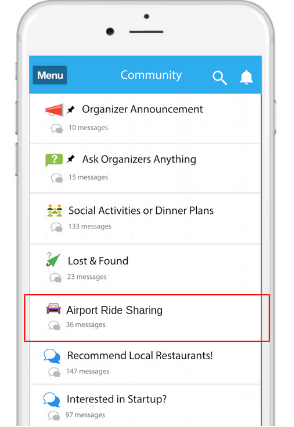 Use this tool to promote social activities you organize for attendees, such as city tours and receptions. You can draw more attendees in, and generate organic buzz! Attendees can also self-organize dinner groups, jogging, and meetups with fellow attendees. See how other events leveraged the Community Board. Casual conversations / event-specific discussions. Attendees can connect by initiating conversations on the board with custom topics like “Useful Tips”, “Recommend Local Restaurants”, “Looking for Mentors”, “Q&A with Speakers”, and more. Ask Anything to Organizers. This interactive feature works as a live “FAQ” and attendees can reach out with any pressing questions about the event, like the Wi-Fi password or locations for panels. You can even set up a post-event survey (download a survey template here) to get feedback on attendees’ experiences. Getting this information before they leave allows you to get the most valuable evaluations to help you at next year’s event. We want your attendees to have an enjoyable trip both to and from your event. 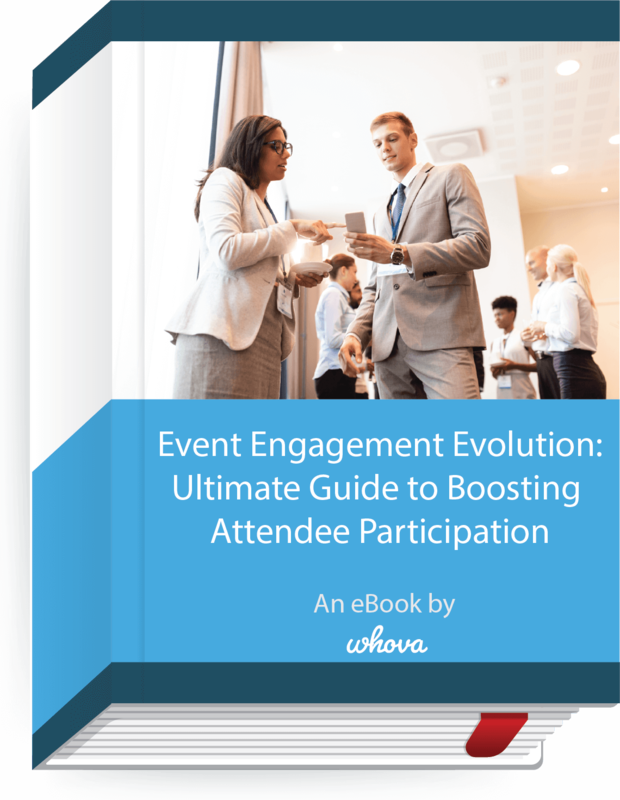 This new feature will help them connect with other attendees before they even arrive, and provides a personal touch to your event organization. If you are interested in seeing a live demo or learning more about the Whova app, please contact us.